The optional Audio Cassette Interface for the Altair Clone duplicates the functionality of the original Altair 88-ACR Audio Cassette Interface. The cassette interface provides the ability to load BASIC and to load and save BASIC programs using a standard audio cassette recorder. The same modulation as the original 88-ACR is used (2400Hz/1850Hz) so that tapes are interchangeable between the Altair Clone's cassette interface and the original 88-ACR. 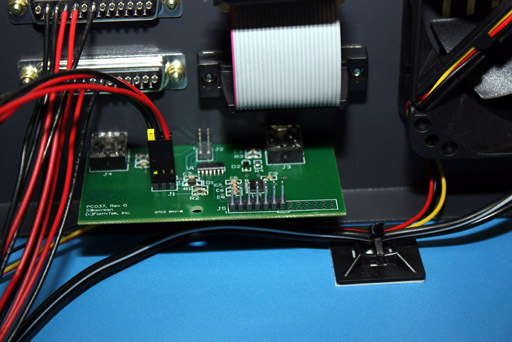 The Audio Cassette Interface adds a third serial port to the Altair Clone so that both of the original serial ports remain available for other uses. 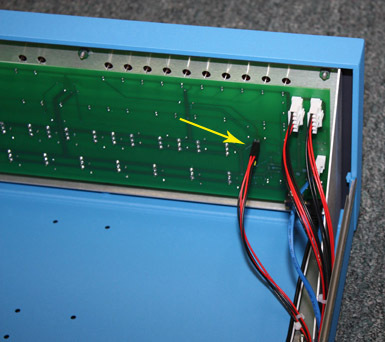 The third serial port is also broken out as an additional DB-25 connector on the rear panel of the Altair Clone. 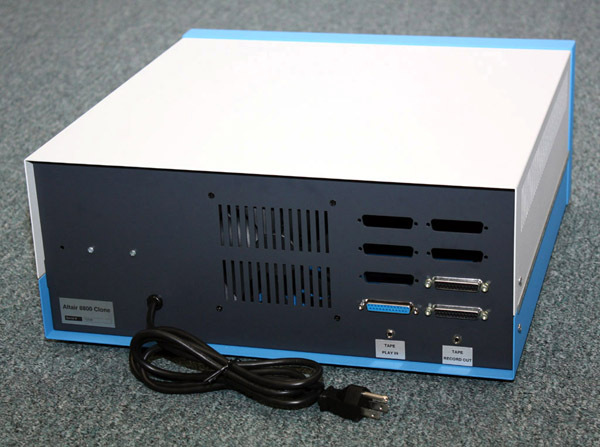 The additional serial port can be used as an 88-SIO or 88-2SIO serial port when not needed for cassette I/O. For example, run three simultaneous users in Timesharing BASIC! For connection to a tape recorder, the Audio Cassette Interface provides the same 3.5mm "Tape Record Out" and "Tape Play In" jacks on the rear panel of the Altair Clone as used with the original 88-ACR. The original 88-ACR Audio Cassette Interface for the Altair provided an alternative to paper tape for loading BASIC and for loading and saving BASIC programs. The cassette interface transferred data at three times the speed of the Teletype's paper tape reader and punch (300 baud versus 110 baud). The 88-ACR was a two board set consisting of the 88-SIO serial interface board and a modem daughterboard that converted the SIO's serial data to/from an audio signal that was compatible with a portable cassette recorder. From the Altair hardware and software perspective, data exchanged with the cassette recorder was nothing more than 300 baud serial data transferred through an 88-SIO board at I/O address 6 and 7. Even without using the Audio Cassette Interface for the Clone, one of the two serial ports on the Altair 8800 Clone can be configured as the same SIO serial port used with the 88-ACR. 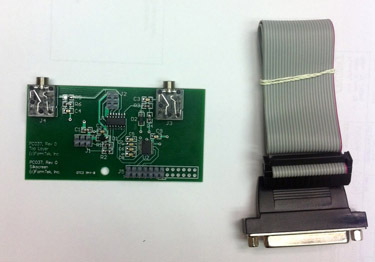 By connecting this serial port to a terminal emulator on a PC, and using the PC to send and receive cassette data, all cassette I/O functions (loading BASIC, loading and saving BASIC programs, etc.) work exactly the same as on the original Altair. However, for a more realistic Altair experience, adding the optional Audio Cassette Interface to your Altair Clone is a great way to go! The Audio Cassette Interface consists of a small circuit board that mounts to the two audio jack holes in the rear panel of the Altair Clone. A four-wire harness connects from the cassette interface to the Altair Clone's main board to provide power and communication. 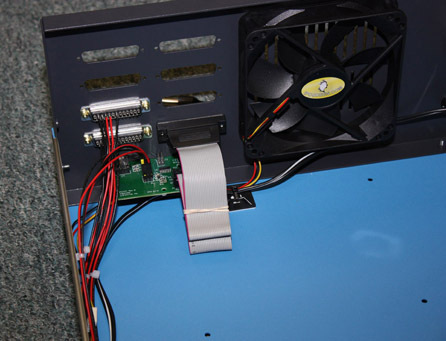 The DB-25 connector mounts in the Altair Clone rear panel and connects to the cassette interface using a ribbon cable. If you order the Audio Cassette Interface when purchasing the Altair Clone, the cassette interface will already be installed. If you already own the Altair Clone and would like to add the Audio Cassette Interface, you may be able to add the cassette interface yourself, or your computer may have to come back to us to install the update. Altair Clone Serial Numbers before 12724: Your Altair Clone must be sent into us in order to install the Audio Cassette Interface. Please contact us for return instructions before shipping us your computer. Altair Clone Serial Numbers 12724 and higher: You can install the Audio Cassette Interface yourself. No soldering is required.